Around sixty people attended the annual town meeting at Sessions House on Tuesday, 13th of May. This was Councillor David Wing's last event as Mayor of Louth before he hands over the reins to Councillor Andrew Leonard on Friday. The Mayor and councillors read out the council's annual report, which was quite extensive so I'm only going to mention the highlights. The Mayor listed major topics the council had tackled this year, including the Livestock Market and the town council's opposition to the updated retail and economic assessment by Nathaniel Lichfield Partners. "Louth Town Council don't consider the conclusions of the Nathaniel Lichfield report are correct," he said. The Mayor also mentioned Louth In Bloom, which gained the town an East Midlands In Bloom Silver Gilt Award in 2013. "Gold for this year, please," he commented. Councillor Roger Featherstone, head of the planning committee, reported that the council had commented on 199 planning applications, a 30% increase on the previous year. On finance, Councillor Brian Burnett was happily able to report that LTC got an unqualified audit for 2012/13. "That means that the auditors didn't find anything to comment on," he explained. Councillor Burnett also reported that the annual precept and support grant for LTC would come to �213, 112 for 2014/15, or �41.31 for a band D property, an increase of 2.9% on the previous year. This increase is due to a 25% reduction in LTC's support grant from central government. The town clerk, Linda Blankley, went into more detail on the town's finances. The loan the council took out to purchase the Sessions House has a balance of �133,182, and it should be repaid by 2021. Until 30th of May the town's accounts will be available for members of the public to inspect on any weekday at the Sessions House. LTC currently employs four people, two in the cemetery and two in the Sessions House, and LTC have created a budget for an apprentice in future. Councillor Jill Makinson-Sanders gave an overview of the town's assets, including the council premises and the cemetery. There are seven signs when you drive into Louth, which Councillor Makinson-Sanders noted had "rotting wood", so a project to refurbish them has begun. She also reported that the council had begun a review of the town's Christmas lights. "They are just beginning to get towards the end of their life," she said. The war memorial on Ramsgate has obtained Grade II listed status, whilst LTC installed a new notice board in partnership with the Coastal Grazing Marshes project. There are also plans for a replacement bus shelter with a notice board and planter on Kenwick Road. 56 burials took place in the cemetery in 2013, giving the council responsibility for 29,018 burials at London Road since 1855. LTC plans to re-open the archway at the London Road end after making structural repairs. "This will be done as soon as we can get it done," Councillor Makinson-Sanders commented. "We know it has upset a lot of people." 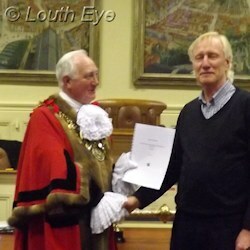 Jerry Gale gave an overview of Louth Town Partnership's work over the year. He noted that there are six volunteer members of the board, which he said represented "an all-time low". However, the partnership is looking at opening a new office in the New Market Hall, and it has applied to become a community interest company. The partnership organises various events> Mr Gale said that "overall they generate a good profit. The events bring in profit but it is not sufficient for us to survive." He spoke of "excellent feedback from readers" with regard to the Love Louth publication, and that sales of the Love Louth shopping bag were "healthy and steady." 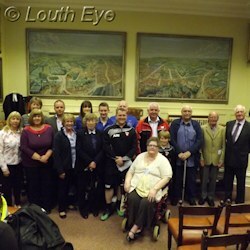 "Louth Town Partnership does struggle to find volunteers," Mr Gale said. However, the group had managed to recruit a volunteer photographer. He reported that volunteers had given 4000 hours of work over the past year. Councillor Sue Locking noted that Louth had come just five marks short of a gold award last year in the East Midlands in Bloom competition. She was keen to stress that the competition is about the whole town, and not just individual floral displays. "If you see a bit of litter or a bit of a weed, just tidy it up," she asked residents. She also made a plea for volunteers for Louth In Bloom. "We're going for gold," she said. Although the room was packed, the public forum was relatively brief. Norman Coffey asked the town council, "could you put pressure on LCC over the ferocity of the traffic wardens?" Mrs Hubball had a complaint about the playgrounds and play parks in Louth. "Not one playground is suitable for my disabled daughter," she said of the ten she had visited around Louth. "There is nothing there for a disabled person to access." The town clerk noted that all of these playgrounds were owned by housing associations or ELDC. One resident asked for a speed restriction of 30mph on London Road, beyond the London Road Pavilion. The council discussed the speed limit on this road in December 2013, voting at that time in favour of lowering the limit. Colin Bunting asked "What can LTC do to put pressure on ELDC over the cattle market?" "We are not in a position to influence ELDC," the Mayor replied. "All we can try and do is ensure the process is a correct one." Alan Mumby of Keep Louth Special spoke about the revised Nathaniel Lichfield and Partners' report, which has clear implications for the cattle market. He said the report was "so flawed that if ELDC go down that route we will launch a legal challenge." Louth Run For Life were also awarded a grant from Louth Town Council. Following these awards, Alan Mumby presented the Mayor with a retail assessment that KLS had produced in response to the updated Nathaniel Lichfield and Partners' report. The annual town meeting saw town finances and the impact of the Localism Bill explained.